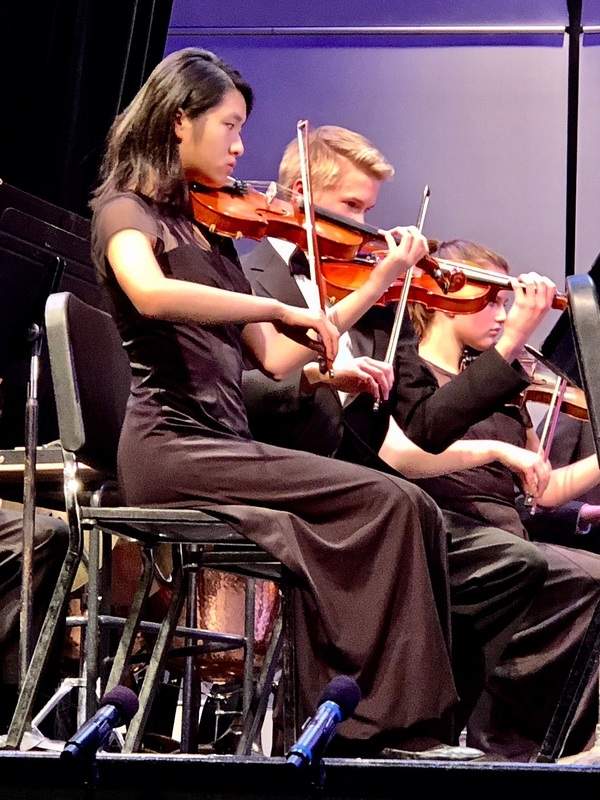 The 77th annual Candlelight Concert debuted last night in the Staples High School auditorium. It’s the music department’s gift to the town. Performances are also set for this afternoon and evening. As it has for more than three-quarters of a century, Candlelight was beautiful, magical and meaningful. And the light snow just added to the wonder. Photographer Lynn U. Miller was there to capture the scenes. For 77 years, Candlelight has featured the lovely “Sing We Noel” processional. 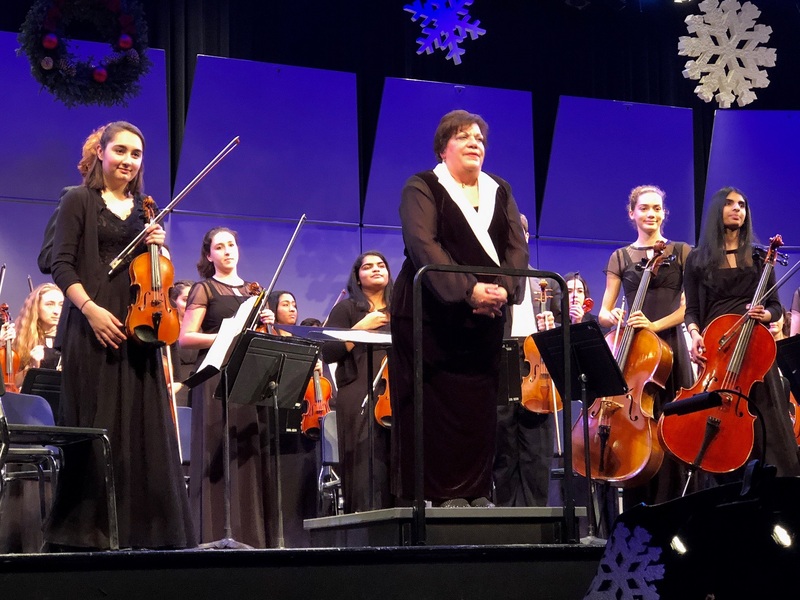 … and orchestra director Adele Valovich took a well-deserved bow. 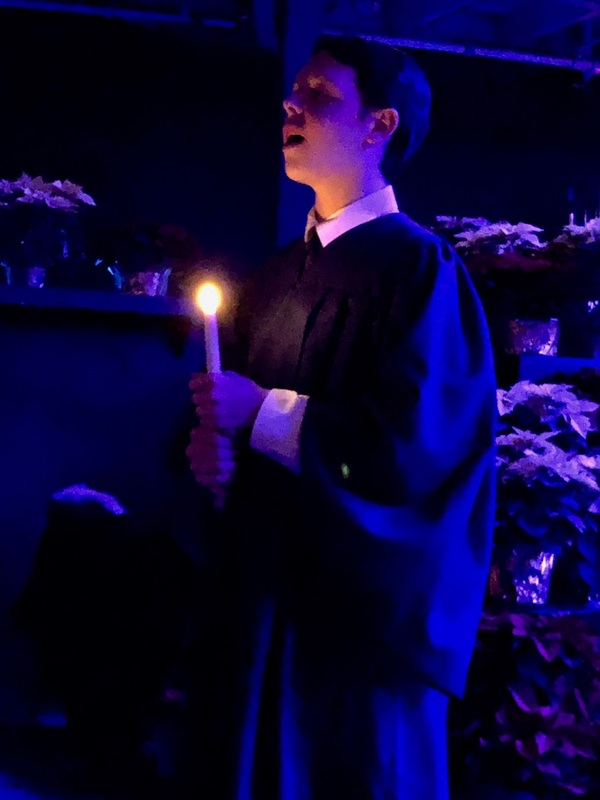 Candlelight included the symphonic and sophomore bands, led by Nick Mariconda, as well as a variety of choral groups. 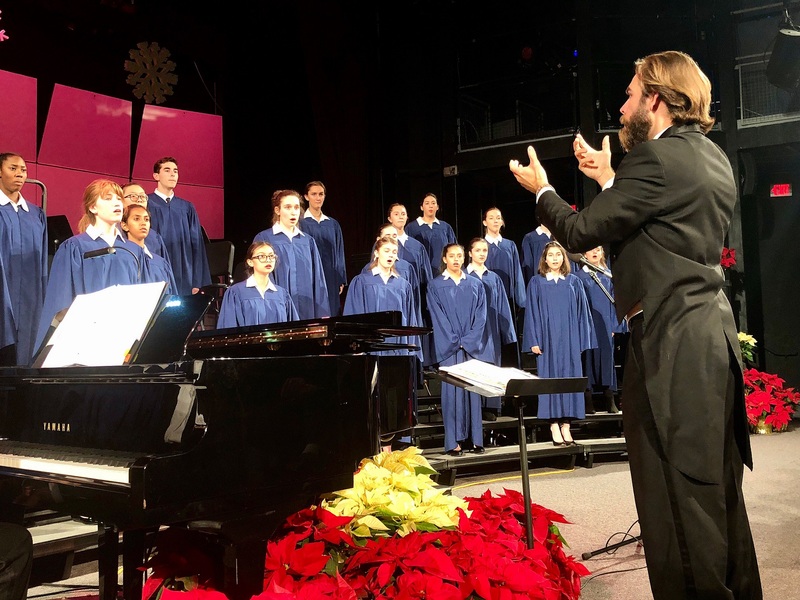 Luke Rosenberg directs the Choralaires (formerly the a cappella choir). 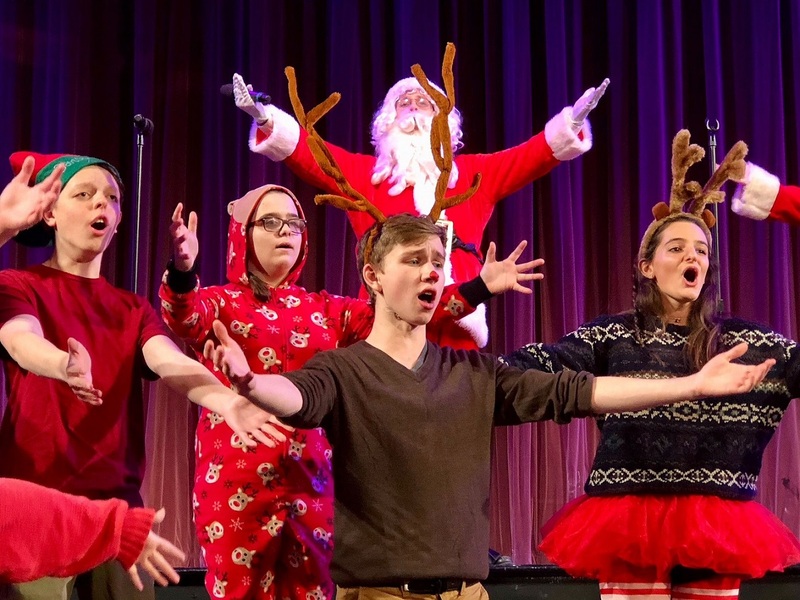 Don Rickenback wrote a jolly, North Pole-themed production number. It wouldn’t be Candlelight without Alice Addicks. 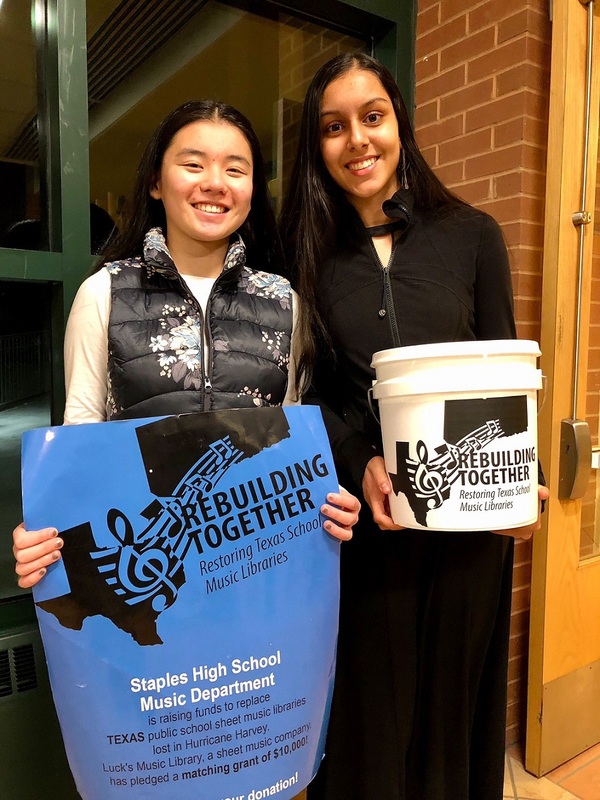 In addition to the traditional “Cans for Candlelight” food drive, members of the Tri-M music honor society collected donations to rebuild music libraries in Texas schools, lost this fall to Hurricane Harvey. 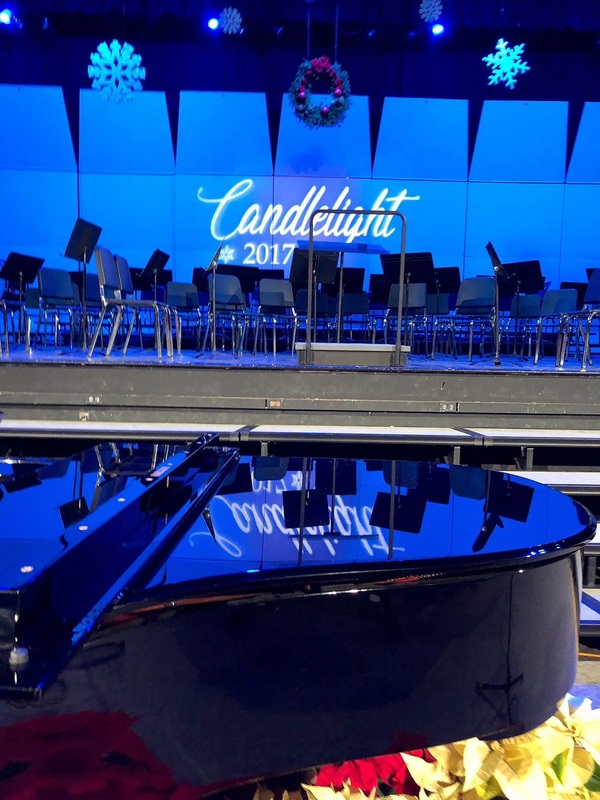 This entry was posted in Arts, People, Staples HS, Teenagers and tagged Adele Valovich, Don Rickenback, Luke Rosenberg, Nick Mariconda, Staples High School Candlelight Concert. Bookmark the permalink. 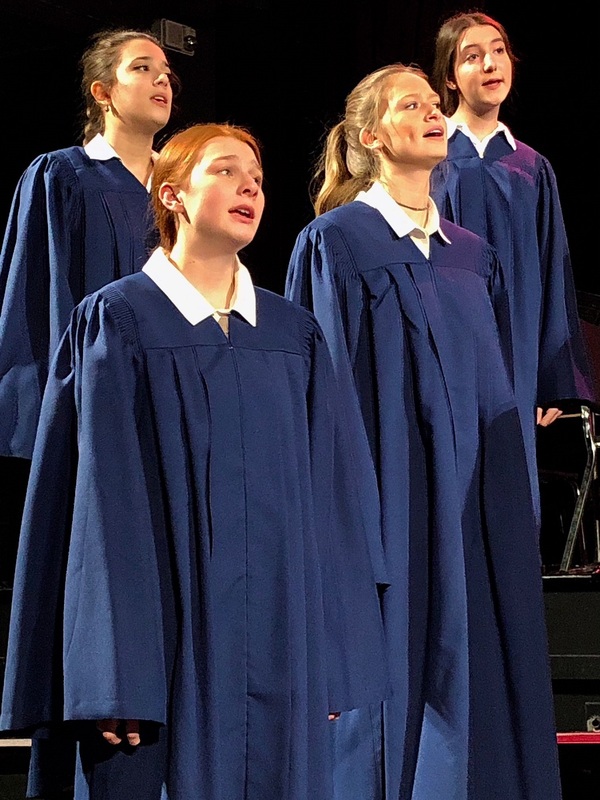 As a former 2nd tenor for the Boys Glee Club, A Capella Choir and Orphenians I will always remember the Candlelight concerts with affection and as the high point of my time at Staples. At a very turbulent time in society the music programs at Staples brought us all together regardless of race, color, creed or philosophy. I’m not sure what necessitated rebranding the ACC as the Choraleers but I’ve been away from Staples a long time. Who can forget the concerts and Messrs. Ohanian, Weigle, Hanulik and Genualdi that brought them forth? Plus the fabulous Ernestine White from BJHS who sparked the love in many, many students for choral music. As long as traditions like this are treasured Westport will always be special. Just looking at all these pictures brings chills to my spine! Love this tradition so much! 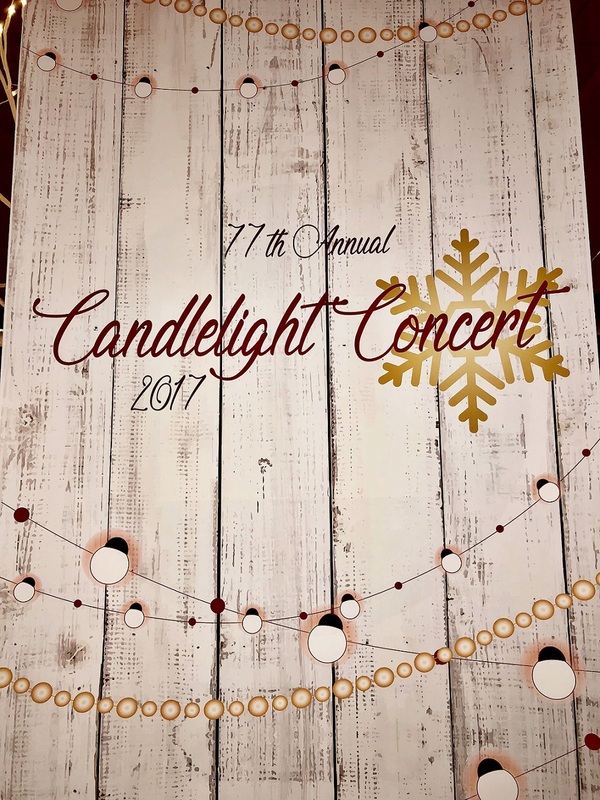 Can anyone explain why every time I see a post about Staples Christmas Candlelight concert I immediately start to sing, Sing We Noel and get all misty eyed? Because once you’ve been part of it, it’s part of your soul. Wonder if they still sing the “welcome yule” in the lobby, pre-show? (not certain of song title … but it was “Yule” something something, I believe). Yes! “Welcome Yule” is still sung in the lobby, just prior to the “Sing We Noel” processional. Meanwhile, a new addition in the lobby, as the audience is arriving before the show: carols played by small groups of brass and percussion musicians. It’s a fantastic new twist for a very old and honored tradition. OMG, I’m so glad they still sing the “Welcome Yule”! I had a singular experience of that tradition, back in 1980’s. I can remember the goosebumps I felt, while singing with an amazing group of my peers in that lobby, as if it were hours ago! I believe, back then, it was a combo/group of orphenian’s and choir members, but the details are fuzzy. All I know for sure is that we were fricken amazing (in my high-schooler mind’s eye … and ear, heh heh). If only our parents all had smart phones/digital camera’s back then … because, to capture those moments would have been priceless. P.S. – I wish someone would have captured the “Welcome Yule” performances on vid/audio, over the more recent years, to share on your blog. 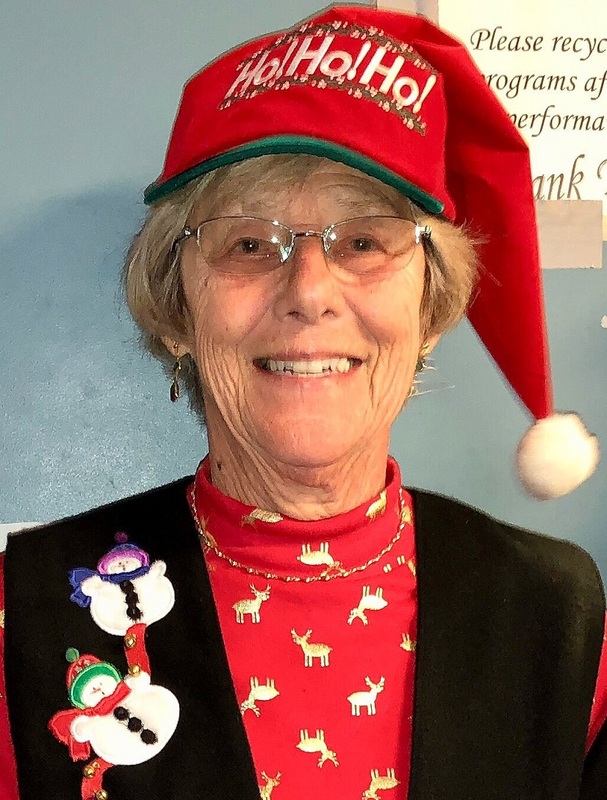 Seems like a worthy addition to the holiday themed posts here, doncha think? Thanks, Sharon, for those great memories. “Welcome Yule” was included on some of the Candlelight CD recordings in recent years. You might be able to find one by contacting the Staples music department! Thanks, Dan…so nice to be able to see the chorus from CA!